A data switch is charged with the job of connecting smaller segments of a single network into a connected whole. It transfers data across a network segment using MAC addresses for reference. 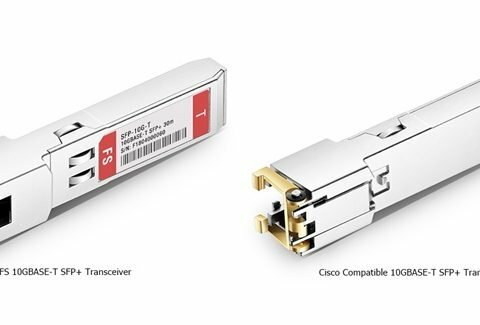 Data switches are extensively used in Ethernet local area networks. A data switch operates on the Data Link Layer of the OSI (Open Systems Interconnection) model. This means that data switches are fairly smarter than hubs, as they can route data on a dynamic level. If the information is destined for a certain computer, the data switch will only send the data to this computer. 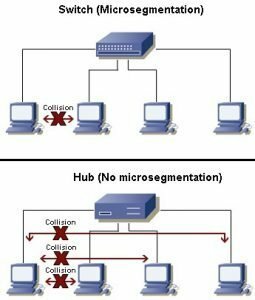 This addresses our collision problem as switches use what is called micro-segmentation, which will be elaborated later in this article. Hub is a network device which controls the number of switches and router for the whole network. A hub is a “dumb” device in that it broadcasts whatever it hears on the input port to all the output ports. The good thing about “dumb” devices is that they don’t need much configuration or maintenance. But this leads to collisions between data packets and a general degrading of network quality. If you have a hub set up between your router and the rest of your network, you’re setting yourself up for a huge headache. A hub looks just like a switch but works differently on the inside. You connect devices to a hub using Ethernet cable and any signal sent from a device to the hub is simply repeated out on all other ports connected to the hub. 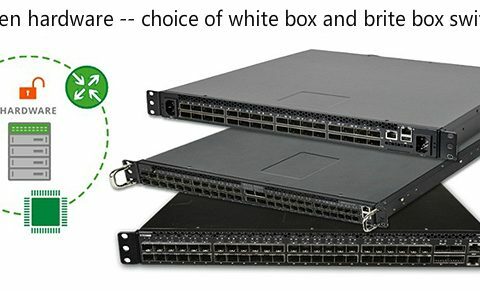 A data switch vs hub? How do they differ from each other? 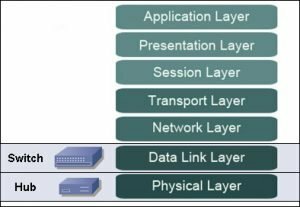 Hubs are considered Layer 1 (Physical Layer) devices whereas data switches are put into Layer 2 (Data Link Layer). This is where hubs and switches mainly differ. The Data Link layer of the OSI model deals with MAC addresses and switches look at MAC addresses when they process an incoming frame on a port. manage the connections between the input port and the output ports, so you won’t run into the collision problem or any of the other issues that plague hubs. As you can see below, there are multiple collision domains or segments for the switch network. If computer A and computer B sent data to each other at the same time, you would have a collision. Computer A and computer C or D, however, will not experience a collision in the process. 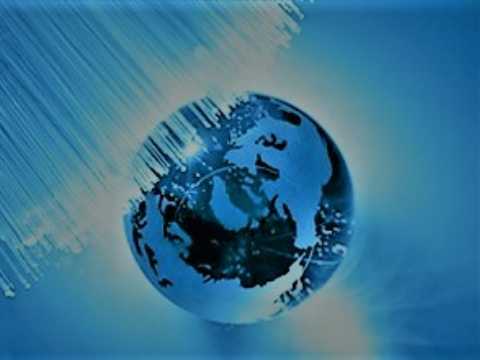 In comparison, for a hub network, there is just one collision domain, which means that if one computer transmits data, it would be interrupted by any of the other computers in the network. Thus, the more devices you connect to the hub, the more collisions there will be in the whole network. The following figure illustrates a data switch vs hub in collision domains. A data switch vs hub, which one should you choose for a home network? If you purchased the device in question within the last few years, the chance is almost zero that it’s a hub. Historically, switches were expensive and hubs were cheap, but advances in technology have made switches so cheap that they don’t even bother making hubs anymore. Thus, nowadays data switches are higher-performance alternatives to hubs in a home network.